My fudge did not harden. Dry much, any ideas to fix it? The flavor is very good. Thanks! 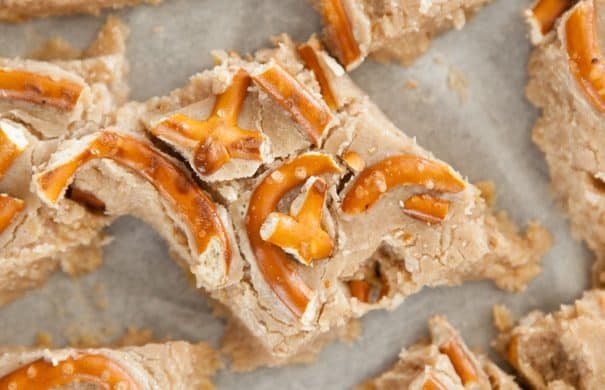 This Pumpkin Fudge with white chocolate chips and pretzels is a no-bake easy homemade fudge recipe. 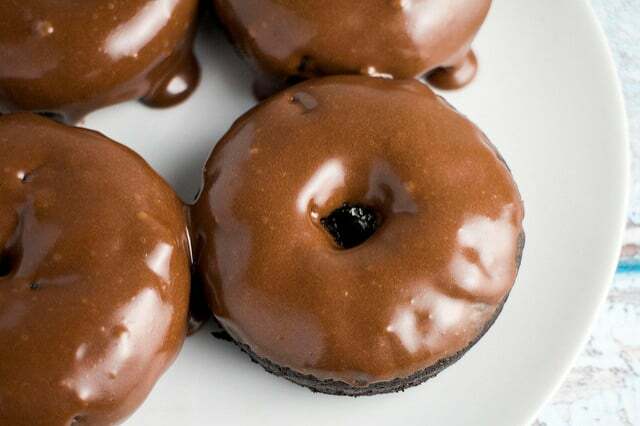 The chocolate and pretzels give it a delicious sweet and salty taste! You can make these as good afterschool healthy snacks. I made this easy homemade fudge recently and it lasted a full day. A full day! I’m surprised it even lasted more than 3 hours with me in the room. Salty and sweet are a favorite combination of mine when it comes to sweets! And that’s what you will get in this easy homemade fudge recipe. This pumpkin fudge is made with white chocolate, pumpkin puree, and some pumpkin pie spice. It’s more on the soft side so it is definitely creamy. 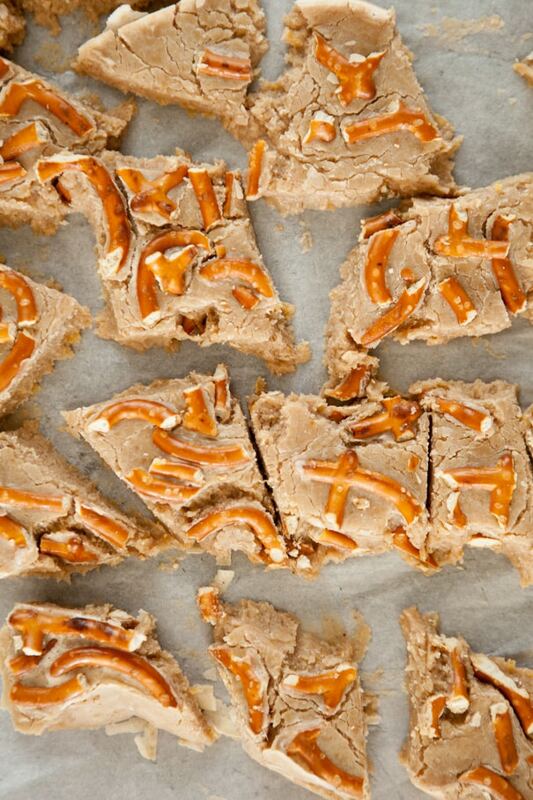 To give it some crunch, we throw pretzels on top. That makes this easy homemade fudge great munching for your kids. And it’s healthy too. It’s a favorite among kids as afterschool healthy snacks. It’s also great to add for lunchbox treats. For this pumpkin fudge, start with melting the white chocolate chips. Microwave them for 30 seconds. Take out after 15 seconds, stir and put them back for another 15 seconds. If you don’t have a microwave, you can melt the chocolate chips on your stovetop using the double boiler method. Add in the rest of the ingredients (except the pretzels!) and transfer the mixture to a baking dish. 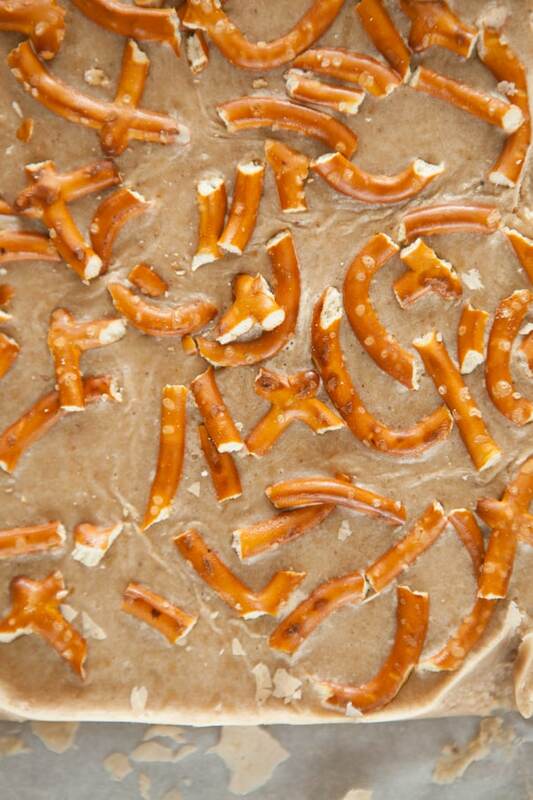 Break your pretzels into smaller pieces and press them gently on the mixture while it cools. Refrigerate for 2-4 hours or until its set. The pumpkin fudge comes out of the pan it’s in one piece. You then cut it up into your desired sizes. You should store the pumpkin fudge in your refrigerator or freezer depending on how hard you like it. You can use this pumpkin fudge as healthy snacks for kids. Fudge was a childhood favorite and I’m glad to say it has stayed that way. Even if I’m 100 years old and I hear the word fudge, I will still grunt with happiness. The pumpkin is a clever way to sneak in vegetables in this recipe. Plus, with this pumpkin fudge, I didn’t use any direct sugar. The white chocolate and the pumpkin puree lends sweetness to this recipe. To balance the sweet flavor, I added those crunchy pretzels. Enjoy! This easy homemade fudge won’t last long! I know mine didn’t. If you’re looking for savory healthy snacks for kids, make these Homemade Kale Crackers and my Sweet Potato Cookies! Say hi to me on social media! Follow me for more recipes and stories. I’d love to get to know you! Let’s be friends! In a microwave melt your chocolate chips and butter for 30 seconds. After 30 seconds, stir and continue microwaving every 15 seconds until it's fully melted. Stir in pumpkin, pumpkin pie spice and vanilla until all combined. Line a 8x8 baking dish with parchment paper thats been sprayed with nonstick spray. Pour mixture into baking dish. Add broken up pretzels on top and softly press down. Refrigerate for a few hours (2-4 hours) until it's set. Cut up into pieces. Store in refrigerator or freezer depending on how hard you want it. I love the idea of pumpkin in fudge. And adding that salty pretzel pieces on top is a nice touch. Great recipe Pamela! Haha, do you also save all the packages? I have a few files full with foreign/cute/odd/horribly ugly packaging.. Sometimes I buy cute packages even though I know the food in it is horrible! Hahaha, that sounds like a fun time… a fudge taste trip! That white chocolate chip package is adorable! 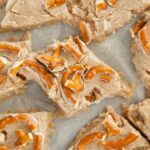 And this fudge looks delicious – -I love the contrast of sweet, soft fudge with crispy, crunchy, salty pretzels. Woah, woah — people store their fudge in the fridge or freezer? I usually store it in my stomach 😉 This looks super tasty and I always fall for the cute packaging, too. They know us so well! This would last approximately 2.5 seconds in my house! I know what you mean Davida! oh my god girl, your recipes always have me drooling! this looks absolutely gorgeous, i don’t think it would last very long around me at all. also, totally with you on the whole packaging thing – i’m a complete sucker for cute packaging in anything! Oh my, this wouldn’t last long in our house – we are huge fudge lovers! 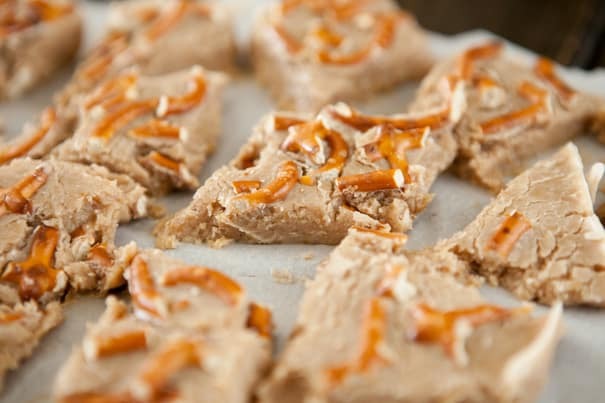 Pumpkin fudge sounds fantastic especially combined with the salted pretzels – yum! I love how quick and easy this fudge is too 🙂 Pinning, thanks for sharing Pamela! Isn’t fudge just the best Kelly? Enjoy! Never attempted to make fudge before.. I guess because we are scared we will eat the entire thing!! lol Looks delicious!! Like that you added the pretzels.. It will give it a nice crunch! I really need some of this fudge! It looks amazing and what a great way to use up some leftover pumpkin! YUM! Sweet & salty – can’t beat it. I totally agree with the pretzels! And I have no willpower when it comes to fudge, just feed me. Mmmm! Even though I am no longer the sugar fiend that I once was, every year my mom and I go to a huge Christmas market and I ALWAYS buy fudge!!! It’s such a treat. Pretzels are like my favourite food, too….this is perfect!!! That must be a delicious holiday treat! Oh gosh…the sweet and salty combo….love it!!! Such a great idea to add in to the Christmas list! This could be dangerous for me… It looks amazing! Oh. Em. Gee. YUM! I want. I know, isn’t the bear just adorable?! OH MY GOSH, I have no self control with fudge. Like, zilch:) I don’t think I could handle white chocolate and pretzels! Talk about delish! I know, isn’t fudge just pure dangerous Mary Frances? We gotta get you some new potatoes Consuelo! I’ll be calling your supermarket in the morning! Yes!! White chocolate is my favorite! This fudge looks so creamy good. I would love a square of it right now! I’m going to have to pay more attention the the sack of potatoes I buy next time! Enjoy the fudge and the cute potato bags! Oh my gosh! I have to try homemade pumpkin fudge at home. I had it once (store bought) and now I have no excuse to NOT make it myself. Love the pretzels! I love that combo too Jackie! Haha, that’s hilarious about the packaging!! I have actually never noticed anything on the potato bags (you can bet that I’m looking next time though). I also loooove fudge and yours looks delicious! Thanks Laura! Hope you find a cute bag of potatoes! Pamela, this is such a unique and yummy creation of yours! I love all ingredients in it, especially 2 of my very favorite things: pretzels and pumpkin! OOh la la what a combo! By the way I received your pen pal package- I didnt want to tell you because I wanted to keep it old school before we had email! But alas! I will be sending yours this week 🙂 yay!!! 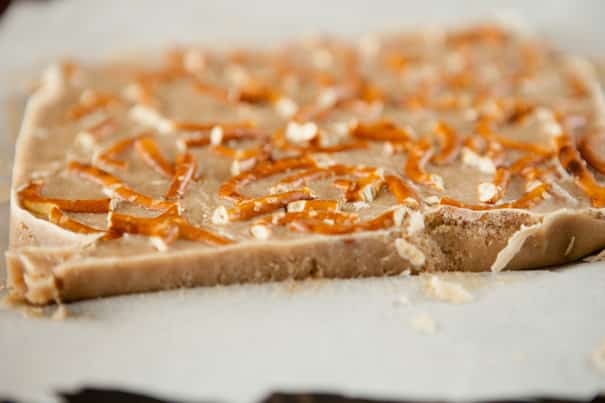 Oh yum – this looks like the perfect combination of sweet & salty that would absolutely addictive and delicious! This sounds so yummy!!! And much easier to make than the kind of fudge that requires boiling a sugar mixture…I can never get that kind to work. I want to find some vegan white chocolate chips… I used to like white chocolate, more than the dark chocolate! Love the fact that it has few ingredients and the recipe looks very easy to veganise! Love salty & savory together! Enjoy Rika, hope you can find some! This is so fun Pamela, it wouldn’t last 3 hours at my house! Well, this fudge definitely could not last with me in the room alone with it for more than an hour! Loving all of the ingredients you used to make this amazing creation! Going on the Oh Fudge board! Totally taking this to Thanksgiving to add to the desert spread!!!! YUMMMMYY! My favorite part – SO simple! High five! I have never seen packaging so cute! I am a sucker for that stuff too..also, I totally judge a book by its cover! I would be all about this fudge! Love, love, love fudge!! 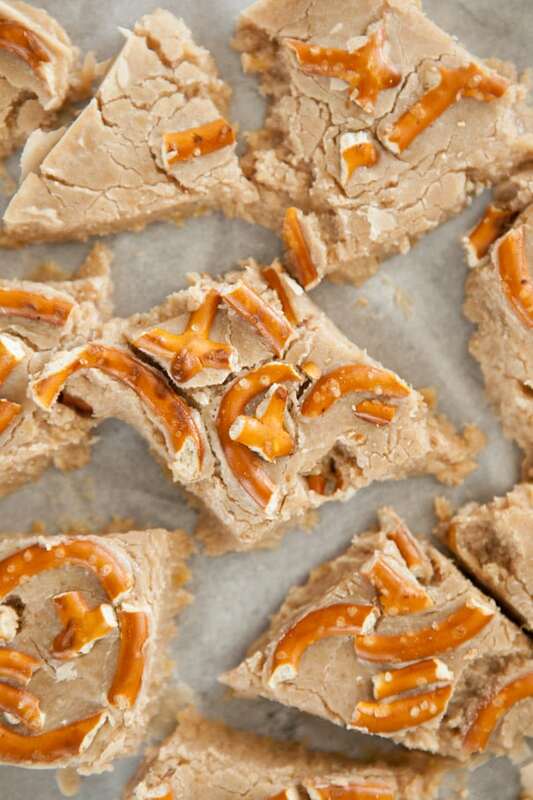 also a great idea adding some saltiness with those pretzels! Enjoy Laura! I made Pumpkin Pie Spice from Cinnamon, Allspice, Ginger, Clove, Nutmeg and Cardamom. Oh man I LOVE this fudge! The pretzels are genius, balance the sweet with some salty. This wouldn’t last long in my house either! Oh Pamela, I gotta have me some of that fudge! I just so happen to have some roasted pumpkin sitting in my fridge… And I do so LOVE that package with the bear in a chef’s hat! How cute is he? Isn’t it just the cutest?! This sounds so simple and awesome! !